Faculty of Social and Political Sciences (FISIP) at Udayana University was established on June 28, 2009. FISIP was the 12th faculty of Udayana University. The initiator and the founder of the Faculty of Social and Political Sciences of Udayana University is Prof. Dr. dr. I Made Bakta, Sp.PD (KHOM) who was the rector of Udayana University at that time. The establishment of the Institute of Peace and Democracy (IPD) in Bukit Jimbaran Campus of Udayana University is as the first way to establish FISIP. IPD is founded by the state as an institute that develops the values of peace and democracy. One of its real programs is to support the establishment of Bali Democracy Forum (BDF), i.e. a forum for world leaders to talk about issues related to peace and democracy, which owes its existence to the Minister of Foreign Affairs of the Republic of Indonesian, Dr. N. Hassan Wirajuda. Then, the momentum was followed up by signing the Memorandum of Understanding between the Ministry of Foreign Affairs and the Ministry of National Education of the Republic of Indonesia with Udayana University. On December 10, 2008, President Susilo Bambang Yudhoyono officially inaugurated IPD in Bukit Jimbaran Campus of Udayana University. This official inauguration strengthens the idea of Prof. Dr. dr. I Made Bakta, Sp.PD (KHOM) to establish FISIP soon. This is because the existence of IPD is highly strategic both for society in Bali and in the world as well as for the academic development, especially at Udayana University. IPD is independent and non-profit institution in nature. It has organized a great number of workshops, research and publications, establishes networks with experts and national and international organizations related to democracy, serves as a laboratory for the development of social and political sciences which are later facilitated by FISIP Unud. It is expected that the synergy between FISIP and IPD can provide new power for developing the values of democracy and peace and intensifying research in social and political sciences. The idea to establish FISIP gained more support from various parties, including the Minister of Foreign Affairs, Dr. N. Hassan Wirajuda. In the course of time, the idea to establish FISIP became increasingly well-prepared after the proposal to establish study programs in order to obtain the operating permit from the Ministry of National Education had been prepared. Those who participated in this attempt were Prof. Dr. I Wayan Suandi, Drs, SH, M.Hum., Drs. Ketut Sudhana Astika, M.Si., Dr. Drs. Gusti Putu Bagus Suka Arjawa. M.Si, who were also assisted by several other faculty members, namely Dr. Ni Luh Kebayantini, M.Si, I Gusti Agung Alit Suryawati, S.Sos, M.Si, I Made Anom Wiranata, S.IP., MA., Ni Made Ras Amanda Gelgel, S.Sos, M.Si, I Ketut Winaya, S.Sos, Ni Wayan Supriliyani, S.Sos and Drs. I Putu Suhartika, M.Si. After the proposal had been prepared and evaluated a few times, the Directorate General of Higher Education, Ministry of National Education finally issued the Operating Permit for the Sociology Study Program (Undergraduate) of Udayana University in Denpasar, Bali, Number: 1518/D/T/2009 and the Directorate General of Higher Education, Ministry of National Education Decree Number: 1519/D/T/2009. Those decrees which allow the establishment of the study program, FISIP Unud was established which was confirmed by the Udayana Rector Decree Number: 304/H14/HK/2009 on the Establishment of the Faculty of Social and Political Sciences of Universitas Udayana (FISIP Unud). At the beginning of its establishment, all the administrative activities of FISIP were carried out temporarily at the Rector’s official residence in Jalan Sudirman, Denpasar. Furthermore, the Senate members of FISIP Unud was appointed by the Dean Decree Number: 01/H14.1.11/PP/00.05/2009 on August 28, 2009 on Senate Members of the Faculty of Social and Political Sciences of Universitas Udayana (FISIP Unud). The Rector of Udayana University, then, issued the Decree Number: 462/H14/HK/2009 on September 1, 2009 on the Designation of Temporary Leadership (Task Executors) of FISIP Unud. The Dean of FISIP Udayana University was Prof. Dr. dr. I Made Bakta, Sp.PD (KHOM), while the Vice Dean I was Prof. Dr. I Wayan Suandi, Drs, SH., M. Hum, and the Vice Dean II was Drs. Ketut Sudhana Astika, M.Si at that time. At the initial admissions of new students, FISIP Unud offered two study programs, namely Sociology Study Program and International Relation Study Program. The lecture started on September 1, 2009. 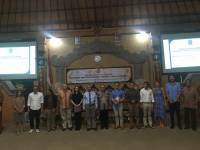 A number of regional and international figures were invited to be a guest lecturer, among others: the Minister of Foreign Affairs of the Cabinet of Indonesia United Chapter I, i.e. Dr. N Hassan Wirajuda on October 8, 2009, explained about Indonesian diplomacy; Minister of Foreign Affairs of the Cabinet of Indonesia United Chapter II, i.e. Dr. RM Marty M. Natalegawa, M.Phil, B.Sc on December 26, 2009, explained about diplomacy; Prof. Dr. Tjipta Lesmana on March 5, 2010, explained about Mass Media Behavior in Contemporary Political Communications in Indonesia; and Nuku Kamka, Russian Ambassador Extraordinary for Indonesia in September 2009, explained about the Future Prospect of Indonesia-Russia Partnership. At that time, the lecturing activities were held temporarily at the Global Distance Learning Network or GDLN Building until FISIP had its own building. On October 23, 2009, the Rector of Udayana University who was also the Dean of the Faculty of Social and Political Sciences (FISIP), i.e. Prof. Dr. dr. I Made Bakta, Sp.PD (KHOM), officially inaugurated the FISIP UNUD Building in Denpasar Campus in Jalan PB Sudirman. To support the teaching and learning activities, FISIP Unud also has built partnership with some local and national institutes such as the National News Agency Institute “ANTARA”. It is initiated by general lecture which attended by eight universities in Indonesia as well as a workshop on journalism on November 5, 2009. The General Affair and Human Resource Director of the National News Agency Institute “ANTARA”, Dr Rajab Ritonga, M.Si has built partnership with the Rector of Udayana University under the Agreement Number: 36/H.14.1.11/PP.03.07/2009. It is about the development of students’ journalistic knowledge and skills, including field work for the students of FISIP Unud in the National News Agency Institute “ANTARA”, where the training conducted by ANTARA Institute of Journalistic Education as well as publication management in Udayana University itself. During its development, in terms of media, FISIP Unud also builds partnership with local and national media such as Bali Post, RRI, and TVRI Denpasar. In the academic year of 2010/2011, FISIP Unud opened a new study program: State Administration. The addition of this new study program was based on the Minister of National Education of the Republic of Indonesia Decree Number: 63/D/O/2010 on June 2, 2010 on the Permit to Establish the State Administration Study Program. The admissions of new students were held by conducting the Interest and Skill Tracing or PMDK. In 2011, FISIP Unud also opened other new study programs such as the Political Science Study Program pursuant to the Ministry of National Education Decree Number 97/E/O/2011, the Communications Science Study Program, and the D-III Program in Library. Therefore, there is a total of five study programs at the undergraduate level: the Sociology Study Program, the International Relation Study Program, the State Administration Study Program, the Communications Science Study Program, and the Political Science Study Program as well as one vocational program, i.e. the D-III Program in Library. To become the Faculty of Social and Political Sciences of Udayana University a higher education institution which can create the competitive, independent, and cultured human resources in the field of social and political sciences. To improve the quantity and quality of facilities and infrastructure intended for educational, research, and community-service purposes.